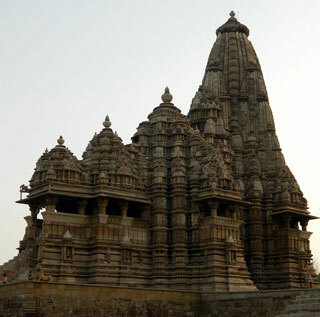 The temples at Khajuraho were built during the Chandella dynasty, which reached its apogee between 950 and 1050. Only about 20 temples remain; they fall into three distinct groups and belong to two different religions – Hinduism and Jainism. They strike a perfect balance between architecture and sculpture. The Temple of Kandariya is decorated with a profusion of sculptures that are among the greatest masterpieces of Indian art. This article uses material from UNESCO World Heritage List article "Khajuraho", which is released under the Creative Commons Attribution-Share-Alike 3.0 IGO License. © InetSolve Pty Ltd. All rights reserved.